Middletown Town Hall is located at 19 West Green Street, Middletown, DE 19709; phone: 302-378-2711. Photo: Hedgelawn, ca. 1856, Route 229, Middletown, New Castle County, DE. Listed on the National Register of Historic Places in 1973. Photographed by Jack Boucher, 1982, Historic American Buildings Survey [HABS DE-189], memory.loc.gov, accessed October, 2014. In 1675 a Swede named Adam Peterson assumed warrants for the land that later became known as Middletown. The first recorded survey of the 200 acres was completed shortly thereafter in 1678. 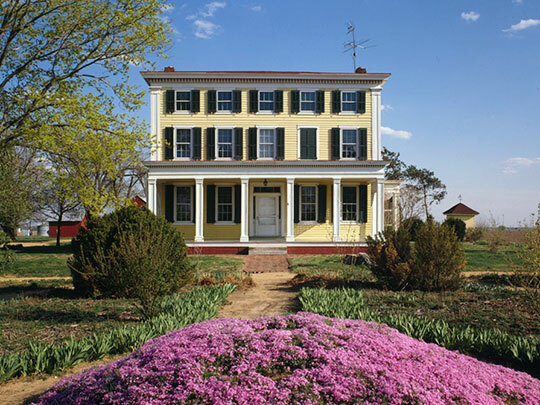 The small hamlet, located approximately 25 miles north of Dover and 25 miles south of Wilmington, was an early crossroads town and one of the few old Delaware towns not on a navigable waterway. It was around the 1750s that the name Middletown first came into use, but not due to its position between the two cities. The town's name refers to its location midway on a trade route known as the "Cart Road" between the head of the Bohemia River and the waters of the Appoquinimink Creek. Since the portage of six miles between these two bodies of water was the shortest on the peninsula, Middletown prospered from its inception. The town's industry stemmed from the abundant agricultural resources found in its hinterlands. Its mills and granaries were located along the western side of town while residential growth initially spread eastward toward Odessa. The construction of the Delaware Railroad on Middletown's western border reversed this trend, drew development inward, and filled out the northwestern side of town. Schools, including the Middletown Academy built in 1826, were erected as Middletown's population grew. The regionally acclaimed school, which once offered students a classical education, is the site of the former Town Hall, but now serves as the offices for the Chamber of Commerce, the Historical Society, and the Middletown Action Network. The building is now known by residents as "Old Academy" and is still owned by the Town of Middletown. Around 1834, the Pennsylvania, Baltimore, and Wilmington Railroad (PB&W) proposed to run its line through Odessa. However, the townspeople wanted no part of the noisy iron horses, so in 1855 the PB&W built a depot in Middletown. Middletown entered into a new era of growth with the arrival of the railroad. The success of the railroad brought prosperity and three decades of economic and social progress. Local farmers found wealth in the peach industry that flourished throughout the Delmarva Peninsula. By the mid-19th century, Middletown had a population of 368 people. Fifty years later it was the largest village in the Hundred. On March 4, 1861, following the granting of the town charter, an election was held for five Commissioners to serve one-year terms. The first Town Council decided the town should be bounded at one square mile. Therefore, Middletown became known as the "Diamond Town of the Diamond State." Middletown began to expand its scope of government services. By March 1866, town leaders began to consider providing street lighting. In 1873 police protection was provided for residents, as well as the organization of the Volunteer Hose Company 14 years later in 1897. The Volunteer Hose Company has withstood the test of time by continuing to provide firefighting services to the town. In 1893 the first Light and Water Commission was organized, making Middletown one of the first towns in the state to have electricity. Water was supplied by a water stack which stands on East Lake Street. In 1922 a fire destroyed the Middletown Opera House. In December of the same year, the Everett Theatre opened and still stands in the historic core of the town. Middletown was reincorporated in 1923 under the Mayor and Council system, and in 1924 the Town took over the daily operations of the water system. The first Mayor was Walter S. Letherbury, who had been a commissioner for 18 years, and he served as Mayor for six years. By 1925 the firehouse needed to expand, so they purchased and remodeled the old Citizen's Bank building. Opening May 30, 1927, for service, this building is now owned by the Town of Middletown and is used by the Appoquinimink Boys and Girls Club. The Middletown Academy was dissolved in 1928 when a new two-story school opened its doors on South Broad Street. The school was Middletown High on one side and Middletown Elementary on the other. Today this building exists as the Everett Meredith Middle School. Dr. Alfred Waters became the principal in 1940, and a new elementary and high school was erected on Lake Street in 1953. This building would later become the Louis L. Redding Middle School, named in honor of the prominent black lawyer and civil rights pioneer from Delaware. Also, in the realm of education, the historic St. Andrew's School—the setting for the 1989 Robin Williams movie Dead Poet's Society—was founded by Alexis Felix du Pont in 1929 and was left to be administered by the Episcopal Church School Foundation. Also related to the religious history of the town, a schism among the Presbyterian Church members in the town led to the establishment of the Grace Orthodox Presbyterian Church in 1937. In March of 1956, the Forest Men's Fellowship of Forest Presbyterian Church organized the Middletown-Odessa- Townsend (MOT) Little League. In 1946 a fire on Valentine's Day destroyed the business block, including an apartment house on the south side of West Main Street and the Witherspoon Inn. The historic inn reopened in February of 1948. Institute for Public Administration, University of Delaware, 2012 Update to the 2005 Town of Middletown Comprehensive Plan, 2012, www.middletownde.org, Accessed October, 2012.